The amendment, proposed by Rep. Robert Aderholt (R-AL) would prohibit federal, state, or local agencies from taking any action against a child-welfare organization, agency, or staff member who “decline(s) to provide, facilitate, or refer for a child welfare services that conflicts with . . . the provider’s sincerely held religious beliefs or moral convictions.” The double negatives are confusing. More clearly: This bill would allow the federal Department of Health and Human Services to dock states up to 15 percent of their foster-care funding if they prevent discrimination in foster care or adoption services. Under the proposed amendment, states would effectively be unable to prohibit religiously affiliated child-welfare agencies from denying services to: LGBTQ children, families headed by LGBTQ people, families headed by divorced parents, and interfaith families. The agencies could, as reflected by the headlines, also turn away potential adoptive and foster parents who are gay, lesbian, bisexual, transgender, queer, single, or myriad other configurations that do not conform to the agency’s religious or moral convictions. "Do not use tax dollars to fund discrimination against LGBTQ people. Block the Aderholt Amendment and any other extremist attempts to federally sanction bigotry and hate." Just wait until they discover that Kingman already has a mosque - Masjid-E-Ibrahim. Hundreds, maybe thousands of kids molested by priests in Pennsylvania. Damn, how many do you suppose they'd find if every state formed a grand jury like PA? To the Barricades! Pastafarians shafted! Gouda grief! That really steams me that the Dutch are straining Pastafarians by disallowing the wearing of colanders on their noodles in official identification photos. Ramen. With no disrespect to Banni, but I'd agree Pastafarians are somewhat of a frivolous religion. On the other hand, wearing a colander on your head really isn't any different from wearing a yarmulke, a turban, or hijab except for the number of adherents and how many years they've been wearing it. 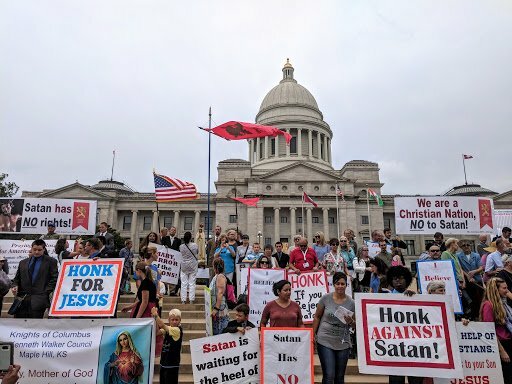 The Baphomet rally protested a Ten Commandments monument installed last year outside the state capitol after lawmakers approved it in 2015. 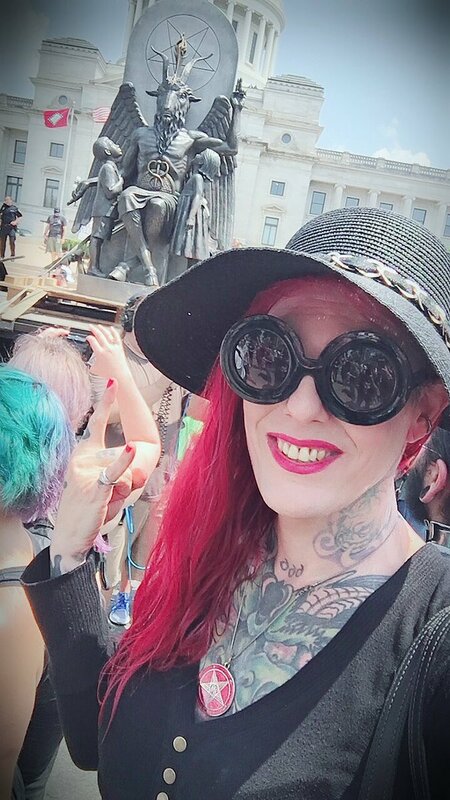 In May, the American Civil Liberties Union sued on behalf of four Arkansas women to remove the monument, saying it violates the First Amendment’s guarantee of religious liberty for all. Everybody is getting excited for our rally tomorrow in Little Rock! I'm going to start the Church of Quantum Mechanics and String Theory. Don't worry. The Religious Liberty Task Force will come to the aid of Baphomet. That's why it was created, right? "Actions, speech or artworks which show disrespect to religion, or makes light of the pretend characters portrayed by their believers." Why can't these weird liberals understand that when we say religious freedom we mean only freedom for christians? The rest of you have chosen not to accept our lord and shall perish in the depth of hell. Freedom applies only to the ones we say it does.MAGA!!! Federal Judge David G. Campbell was appointed by Shrub. Privately - I would have dropped him. Professionally - Security in room, restraints if necessary, immediate Haldol injection. His announcement was sent out to all the brethren on their "official press site, mormonnewsroom.org. The religion’s main website remains mormon.org." The artists formerly known as the Mormon Tabernacle Choir, who will presumably now need a new name. I gotta get the review thing down. I copied the link but never pasted. Thank you. Interesting topic, made me go looking. "Russell M Nelson says the faith should only be referred to by its full, 11-syllable name"
We now know that he has never once used Twitter. Alabama preacher "speaks in tongues" to complain that witchcraft is going to harm Trump. To be fair, with tens of millions of women opposing the Grabber in Chief, including Hillary , he is correct to an extent. I remember this idiot, but I can't remember exactly what the scandal was that caused him to run over the state line. He was living in a million dollar house and all his other excesses were big news, but there was some big scandal. The congregation enthusiastically agreed with cheers." didn't he just violate his tax exempt status? Just to be clear, I meant literal witches above, not figurative ones. but I can't remember exactly what the scandal was that caused him to run over the state line. He was living in a million dollar house and all his other excesses were big news, but there was some big scandal. I barely skimmed, maybe you'll want to take a trip down memory lane. No, they are only restricted from endorsing or opposing a candidate. They can push any issues they want and pray for anyone they want. Then, even the proscription on endorsing/opposing a candidate is no longer enforced thanks to Christian con screeching, congressional indifference or hostility, and an IRS cowed by some Obama era excesses in targeting con groups. Hyatt said it would be unlawful to cancel on hate group Act for America. But Muslim Advocates said that’s untrue. Pat Robertson thinks he is Wonder Woman, nttawwt. Televangelist sends out an anti-storm incantation via the Christian Broadcasting Network. In a clip posted online by Right Wing Watch, he asked followers to “put a hand out toward the Atlantic” and repeat an incantation. He warned followers that they must have no doubts in their faith for the ritual to work but added that the “shield” has worked against previous hurricanes. To receive Pat Robertson's Protective Shield, send $19.95, includes S&H, to Televangelist Hurricane Protection Shield. Right now, with this impending hurricane moving fast, he will add a second protective shield for the price of $19.95; just pay for S&H. Call 1-800-GOD-PROTECT, now!, before the hurricane destroys your home, and perhaps you and your love ones. Don't wait, call now. Pat Robertson has a hotline to God, and he tells Him whom to protect. Robertson's proven Protect Shield of prayers saved countless lives and billions of dollars from destruction in Puerto Rico with Hurricane Maria; and don't forget Katrina because Pat's work was there also. Call now. Good, I'm taking my generator, power cords, gas, bottled water, flash lights, medical kit and food supplies back for a refund! Pat of all people should know that for his incantation to work he has to be in a small boat right in front of the hurricane. And when the storm strikes land anyway it will be because his followers didn't have enough faith. That's a steal, probably cheaper than calling one of those psychic networks!